Alpha Chi Sigma will be holding multiple informational sessions to communicate with potential new members about the possibility of joining this National Chemistry Fraternity. The first informational (2.5.2019) will feature some fun Chemistry and non-chemistry board games, so persons considering joining can interact with active members. The second (2.7.2019) will consist of making slime, having fun with the slime, and discussing the chemistry behind the gooey substance. Lastly, (2.12.2019) there will be an ice cream bar to remember the long-standing tradition of making Liquid Nitrogen Ice cream. Contact the Vice Master Alchemist Meghan Elliot Sutalski for more information. 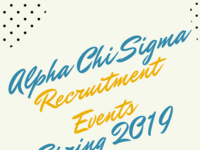 Alpha Chi Sigma will also have members attending the Spring O' Rama so persons interested can also find out more information there.